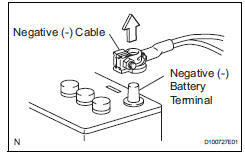 Certain systems need to be initialized after disconnecting and reconnecting the cable from the negative (-) battery terminal. Before performing electronic work, disconnect the cable from the negative (-) battery terminal to prevent component and wire damage caused by accidental short circuits. When disconnecting the cable, turn the ignition switch off and headlight dimmer switch off and loosen the cable nut completely. Perform these operations without twisting or prying the cable. Then disconnect the cable. Clock settings, radio settings, audio system memory, dtcs and other data are erased when the cable is disconnected from the negative (-) battery terminal. Write down any necessary data before disconnecting the cable. Do not open the cover or case of the ecu unless absolutely necessary. If the ic terminals are touched, the ic may be rendered inoperative by static electricity. Do not pull the wires when disconnecting electronic connectors. Pull the connector. 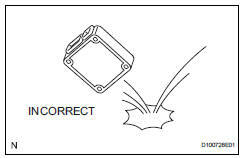 Be careful not to drop electronic components, such as sensors or relays. If they are dropped on a hard surface, they should be replaced. When cleaning the engine with steam, protect the electronic components, air filter and emission-related components from water. When measuring the resistance of a wire connector, insert the tester probe carefully to prevent terminals from bending.